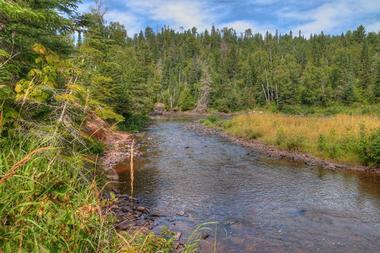 Grand Portage is a beautiful territory located on the northeastern tip of Minnesota along Lake Superior. It features winding rivers, picturesque shorelines, sprawling meadows, thick forests, and hilltops with sweeping 360 degree views. Nature lovers will appreciate the flourishing flora and fauna of the area, as well as marvelous views of waterfalls along Pigeon River, including one at an impressive 120 feet in height. Mount Josephine is a majestic summit in the Sawtooth Mountains that overlooks Wauswaugoning Bay, Isle Royale, Grand Portage Bay of Lake Superior, the Susie Islands, and Pigeon Point. Located on the Grand Portage Reservation, the mountain offers visitors a moderately strenuous hike to its peak, with an elevation of approximately 1,342 feet. Visitors can access the main trail from the side of Highway 61. However, hikers who want a less vigorous or time-consuming trek can choose to ascend from the small parking area in the village of Grand Portage, taking the assigned trail up approximately 656 feet to an area where an old fire tower and several lookout points are situated. Grand Portage State Park is comprised of 278 beautiful acres of land in the northeastern part of Minnesota, at the very tip where the United States and Canadian borders meet. The park’s flora consists of mixed hardwood that includes mostly quaking aspen and paper birch, with occasional eastern white pine, white spruce, northern white cedar, balsam fir, and black ash. Visitors may see a few animal species roaming the grounds when visiting the park, including moose, white-tailed deer, red fox, black bear, beaver, and river otter. Visitors can enjoy a 3.5 mile hike to Middle Falls, explore the 120-foot cascading waterfall, or simply take in the breathtaking views over Isle Royale National Park and Lake Superior. 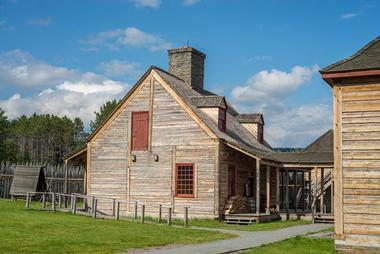 Visitors will find the Grand Portage National Monument situated along Lake Superior’s north shore in Grand Portage, Minnesota. The monument preserves vital Anishinaabeg Ojibwe heritage along with history regarding the area’s fur trade activity. The 8.5-mile footpath that bypasses rapids and waterfalls on the Pigeon River’s last 20 miles is the area’s historic Grand Portage. Visitors can enjoy a hike along a trail surrounded by hardwoods and evergreens as it switchbacks up Mount Rose; at the top they can take in breathtaking views over the historic depot, meadows, and shimmering Grand Portage Bay. Highlights include the Great Hall, Historic Gardens, the Canoe Warehouse, and Ojibwe Village. 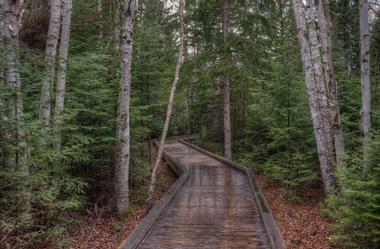 Grand Portage State Forest is a beautiful state forest situated near the Hovland and Grand Portage communities in Cook County, Minnesota. The forest is made up of 99,200 acres of picturesque landscape, perfect for several different forms of outdoor recreation. 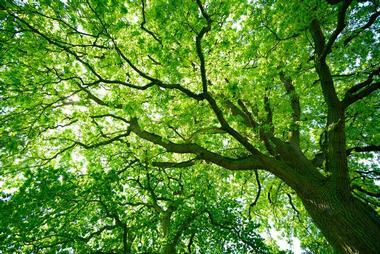 Much of the forest’s flora consists of paper birch, quaking aspen, white spruce, eastern white pine, black ash, and northern white cedar. The forest is loaded with a variety of animal species that include black bear, moose, white-tailed deer, red fox, red squirrel, and much, much more. Visitors can enjoy fun outdoor activities including hiking, mountain biking, camping, canoeing, and fishing. Pigeon River makes up part of the United States and Canada border between the province of Ontario and Minnesota’s Grand Portage territory. The river’s origin comes from a collection of lakes sprawled along the United States and Canada border. 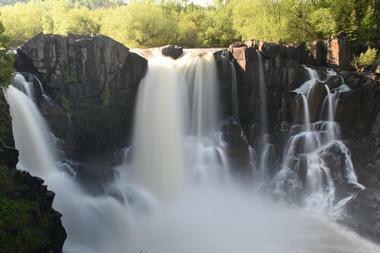 There are popular places along the river that include High Falls – a 120-foot high waterfall. Middle Falls, while not as impressive in size, is also still very beautiful. 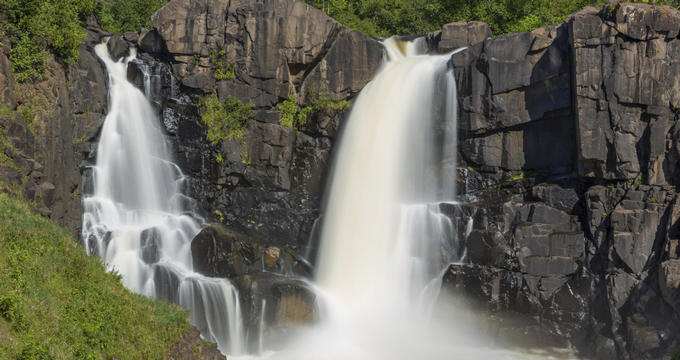 These falls are included within both the Grand Portage State Park in Minnesota, and the Pigeon River Provincial Park in Canada’s Thunder Bay District, Ontario. Visitors can enjoy fun river activities that include fishing, canoeing, kayaking, and whitewater rafting. Grand Portage Isle Royale Transportation Lines is a water transportation service headquartered in Grand Portage, Minnesota. 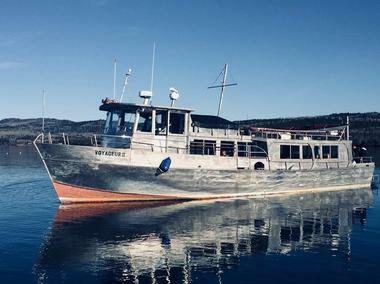 The gateway to Michigan’s Isle Royale National Park, this transportation company is equipped with two boats, giving them the flexibility to offer several different travel options, as well as multiple drop-off and pick-up locations around the island. Day trip passengers will appreciate the short distance and fast trips to and from the island. During the trips visitors will see many points of interest that include the Spirit Little Cedar Tree – a white cedar over 400 years old, the 182-foot steamship America shallow water wreck, and the impressive Rock of Ages Lighthouse. Visitors will find Grand Portage Lodge and Casino situated along State Highway 61 in Grand Portage, Minnesota. The casino features a 15,000-square-foot gaming area equipped with over 450 video, multi-game, and multi-line slot machines. Visitors can also try their luck at the casino’s adrenaline-pumping table games that include Blackjack and Progressive Three Card Poker. Players can grab a drink at the easy-going Antlers Lounge before heading to the Island View restaurant for a juicy steak cooked to perfection. 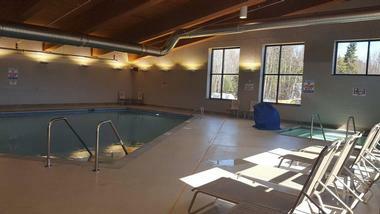 Guests won’t want to miss the opportunity to get in a rigorous workout at the lodge’s state-of-the-art fitness facility, take a dip in the shimmering pool, or sweat out toxins in the rejuvenating sauna.